Crops can reflect the sun’s shortwave radiation back into space, helping to cool the Earth. With its yellow flowers, canola’s reflectance is more than most other crops, providing a cooling effect of about 0.5°C during the growing season as compared to a crop like wheat. The canola flower is more than just a pretty sight – it’s highly reflective! A flowering canola crop creates a bright yellow canopy covering approximately 20 million acres in Western Canada. This canopy, which reflects solar radiation away from the Earth, has the potential to provide a significant cooling effect. A small change in reflected solar radiation can change the temperature on a global scale. Desjardins explains, as a general rule, an increase in the reflected radiation by one Watt/m2 on a global scale can decrease the temperature at the earth surface by 0.5°C. To measure the amount of reflected shortwave radiation at the field scale, researchers use upward and downward looking pyranometers mounted on either a tower or airplane. Satellite-based sensors, such as Moderate Resolution Imaging Spectrometer (MODIS), show vegetative growth and can also be used to estimate the fraction of solar radiation reflected by crops growing anywhere in Canada. Sensors used to measure all the shortwave radiation between 0.3 and 2.8 microns, compared to the eye that sees only 0.4 to 0.7 microns. Land use change, management practices such as no-till and crops can create cooling, not just through reflectivity and carbon sequestration, but also through transpiration which results in more cloud formation and more shortwave radiation reflected,” adds Desjardins. “Although we have not yet completed our analysis, overall canola has a higher albedo than most other crops, which adds up to a cooling of about 0.5°C during the growing season as compared to a crop like wheat.” Published results are expected to be available in summer 2019. 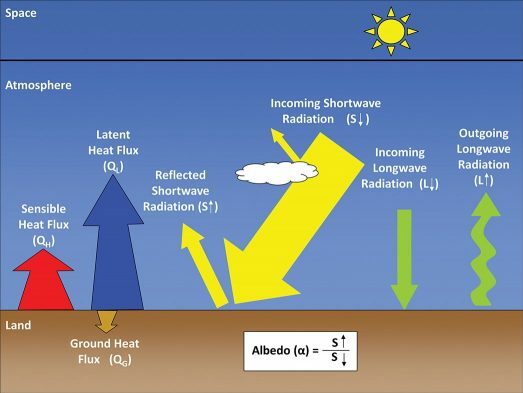 Albedo is the fraction of solar radiation reflected back into space. Albedo ranges from 0 to 1. Snow has an albedo of 0.9. Albedo values for crops average 0.217 for soybean, 0.221 for corn, 0.202 for spring wheat and 0.247 for canola. Credit: Science and Technology Branch, Agriculture and Agri-Food Canada.